I spotted these shampoo and conditioners while shopping a few months back. 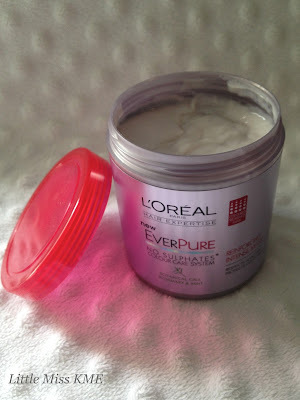 After reading some reviews I was unsure how I would get on with the L’Oreal EverPure range. Most of the reviews were very mixed, so I was eager to try it out and pass my own judgment. 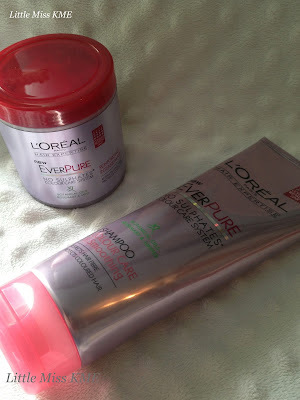 I bought the L’Oreal EverPure Colour Care and Smoothing Shampoo along with the L’Oreal EverPure Reinforcing Intense Mask. The main selling point for me is that the L’Oreal EverPure range contains NO Sulfates!! 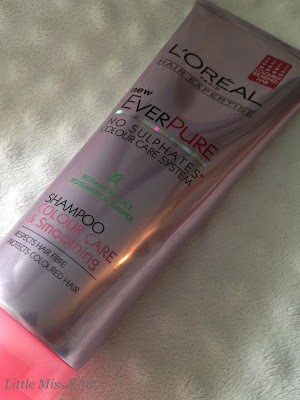 I have coloured hair so I do find some shampoos can make my hair look dull, but the EverPure shampoo and conditioner didn’t. These products smell amazingly fresh to me, probably due to them containing botanical Rosemary and Juniper Oils. I found the shampoo to be very thick in consistency (unlike other brands I have tried). And the mask was fabulously effective at detangling my hair in a matter of seconds. Over all I am very impressed with these products. I would say that you have to be careful how much mask you apply to your hair; if you use too much your hair may be left looking a bit limp, as mine was on one such occasion. Check out the L’Oreal Website for stockists and details of the full EverPure range.